Without a quorum, the bicameral report on the Tax Reform for Acceleration and Inclusion or TRAIN bill, the first package in the Comprehensive Tax Reform Program (CTRP) of President Rodrigo Duterte’s administration, was ratified by Congress just before midnight of December 13, the penultimate day of session for the year. The government, through the Department of Finance (DOF), has shined its light on the provision on lowering personal income tax to say that the TRAIN is for the poor or for the public to gain, with more than 7.5 million Filipinos to be exempted from paying income tax with the new schedule. Those who earn P250,000 below annually or around P21,000 monthly and with bonuses and 13th month pays up to P90,000 would now be exempted from personal income tax. Those who fall in this pay grade, in addition to minimum wage earners who get as much as P13,000 monthly only, are entry-level professionals in government and in the private sector such as teachers and nurses and business process outsourcing employees. ACT Teachers Partylist Rep. Antonio Tinio admits the lower personal income tax to be a true relief for the people. However, he said, more new or higher indirect or consumption taxes on sugar-sweetened beverages, petroleum products and removed value-added tax exemptions among others, overwhelm this (solitary) benefit of the TRAIN. Also in contrast to government’s stance that the TRAIN is pro-poor, Makabayan congressmen opposed to TRAIN and independent thinktank IBON Foundation found that the rich would gain more from TRAIN. Furthermore, according to IBON Foundation, the country’s rich are among the biggest gainers from the TRAIN’s income tax reforms. “Low and middle income families earning up to some P60,000 a month will have a few thousand up to P80,000 additional take-home pay annually. The richest 1% of families with incomes of P1.5 million or more a year will have an average of P100,000 to over P300,000 additional take-home pay annually, especially when income taxes are lowered further in 2023,” said Sonny Africa of IBON Foundation. Africa also said that under TRAIN, an estimated P927 Billion of potential government revenues will be lost due to lower personal income taxes of the richest 1% of the population, and another P16.9 billion for flatting estate and donor taxes. Some surmise this omission would favor San Miguel Corporation owner Ramon Ang, whom Tinio noted to be ‘an oligarch whom Duterte praised among oligarchs he usually lambast in previous speeches’. Ang was said to be Duterte’s friend and campaign funder, also to whom the Philippine Daily Inquirer would be sold after Duterte’s tirades against the newspaper when it was still publishing it’s ‘Kill List’ in the war on drugs. While in the proposal stage, earnings for higher taxes were said to be allocated for social services and the government’s ambitious P8-trillion Build, Build, Build program to usher in the ‘Golden Age of Infrastructure.’ However, infrastructure got the better of it, as earnings on the ratified TRAIN bill was earmarked for general appropriations of 30% for social services, 70% for infrastructure (including military). Also, the next packages of the tax reform may contain the proposition to lower corporate taxes to follow suit the lowering of personal income taxes. The DOF argued that this would make the country more inviting to investors. Another proposition that would set back lower income families is the proposal on the ‘salt tax’, or the tax on food with salt. If not TRAIN, then what? Tinio said it has always been Makabayan’s position that government should make their tax collection more efficient. Government has P400 billion of uncollected taxes—the amount is more than could be earned from TRAIN given the collection of new and higher taxes would be efficacious. Given this, he said there should also be no new taxes, especially those that are directed to squeeze earnings from ordinary people. There should also be no ‘sacred cows’ such as alcoholic beverages. 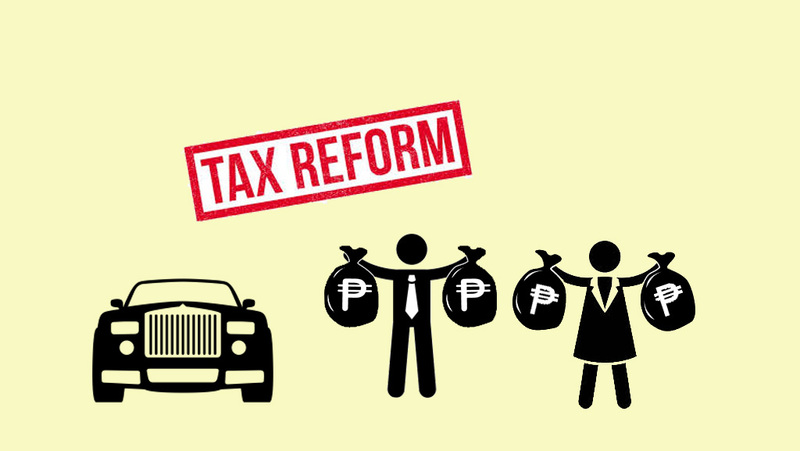 With the provision to lower personal income taxes, more than others probably, the DOF had said the measures in the CTRP were to update, make more efficient and correct the regressive tax system in the country. A regressive tax system is where the poor are taxed more than the rich who earn and reap the wealth in a society more. To turn this around is to make taxation progressive, where the rich is taxed more than the poor and the taxes go to social services. The advantages of progressive tax systems include leaving more money in the pockets of low-wage earners who are likely to spend all their money (saving only little or none) that would, in turn, stimulate the economy. Progressive taxes also allow the people with the greatest amount of resources to fund a greater portion of the services all people and businesses rely on, such as roads, traffic lights, communication, public transportation and other public utilities and also social welfare such as health care, education, housing, etc. However, the taxation in the Philippines has remained regressive since time immemorial as the government’s nature of bureaucrat capitalism has put politicians allied with businesses or themselves landlords or big business holders in power, and allowed the rich and foreign corporations to be taxed less, even as they earn more and even plunder the country’s resources. Big businesses fund electoral campaigns and indubitably receive their return of investments ten-fold if their champion wins the seat. This system has widened the gap between the poor and the rich and has alienated the people from their own country as they thrive in smaller and smaller public spaces and enjoy lesser and lesser social goods and services. “Hundreds of billions of pesos can be generated only if the government were unafraid to impose higher taxes on country’s wealthiest families who have accumulated trillions and can well afford to contribute more to government revenues than they already do,” said Africa, a summation of the opposing point of view on the government’s TRAIN. With TRAIN, the regressive taxation system in the country remains. Would the coming packages of the CTRP really be any different?